The photograph is neither clear nor particularly interesting, but, for the sake of completeness, here it is. 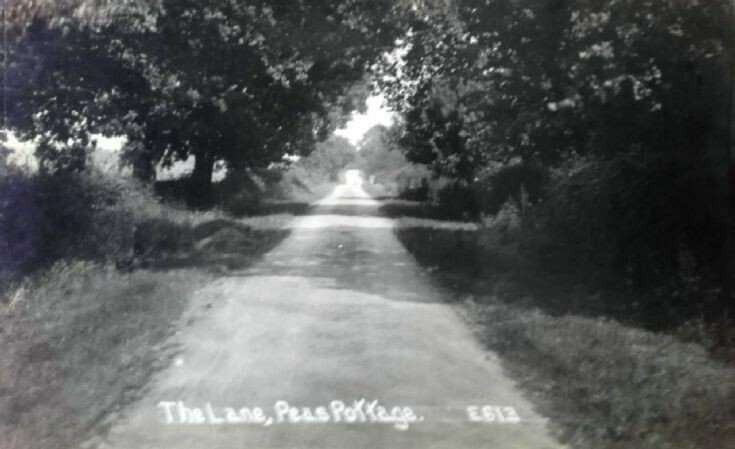 The postcard simply calls it the The Lane, Pease Pottage, but surely it must be Parish Lane. I did “drive” along the lane in both directions using Google Maps, but could not find the precise location. I came to the conclusion that perhaps this stretch of road comprised, in part, the first ¼ mile of the Parish Lane which use to start just 40 yards from the front of the Black Swan. This section of the lane was sacrificed for the A23 cutting, the bridge, the service station, and the roundabout. Select Open Document to view the five pages in volume 55 of the 1912 Sussex Archaeological Collection devoted to the worked stone flints found between the A23 at Pease Pottage, and the London to Brighton railway line at the far end of Parish Lane. When the discovery of the stone artifacts were made known the land was part of the Tilgate estate and owned by John A Nix who had inherited the estate, including Tilgate House, from his father, John H Nix. Some relevant history of the estate is included with picture #364. The two farm labourers who collected the stone implements were Messrs Lee and Johnson. Click on picture #148 to see a photograph of Henry and Mary Lee who lived at New Buildings in Parish Lane. I could not find Mr Johnson in any records. I have been contacted by Chris Johnson, formerly of Truggers and now living at Haywards Heath, who has identified the Mr Johnson who, with Henry Lee, collected the flint implements. John Johnson (1865-1916) was Chris’s paternal grandfather and would have fitted the profile in the SAC book. He married Annie Jane Denman in 1886 and according to the 1911 census they had had 14 children, of whom only 10 were still alive. They lived at Bellevue Farm, just to the north of Parish Lane, which was then part of the Tilgate estate. According to the census return, John was a stockman on the farm. Bellevue is now known as Hardriding.